1. Boil jumbo shells according to package. Drain and set aside covering with a wet paper towel to keep from drying. 2. Brown ground meat in a skillet together over medium heat with diced onion. Cook until no pink meat remains. Drain any excess fat. 3. Thaw spinach in a colander under warm water. Press to remove excess water. 4. In a large bowl, mix together parmesan cheese, ricotta cheese, spinach, meat, onions and spices including salt and pepper. 5. Take meat and cheese mixture and gently stuff into shells. Line a large baking pan or two smaller baking pans (freeze one!) with shells. 6. Cover shells with tomato sauce. Top with slices of fresh mozzarella. Bake at 375˚ for about 20-25 minutes or until cheese is melted and sauce it bubbling in the center. Garnish with fresh parsley before serving. These healthy stuffed shells are going to rock your world! They’re stuffed with spinach, a yummy blend of cheeses, then lightened up with ground turkey. If you like healthy food but you still like things to taste good… this recipe is for you, baby. This recipe feeds a large family or a small crowd. These stuffed shells are pretty easy to prep but do take a little time so I’d recommend making two batches at a time—have one for dinner and either share one dish with a friend or put it in the freezer for an easy heat-and-eat weeknight dinner. These freeze and reheat well using a casserole dish. I use glass Pyrex dishes with lids. You do need to be careful about reheating them in the oven though since glass can shatter if you change its temperature too quickly. So I usually let mind sit out for a little bit then heat it up with the oven rather than putting it in a pre-heated oven. I like the glass because you can easily see what’s inside. 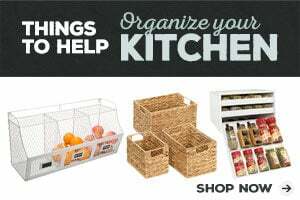 Helpful when you’re storing in a packed freezer. Now, there are other options if you’re not sure about glass. This cast iron casserole dish for example. It’s going to be heavy but also heavy duty. The color is fun and makes me happy. It’s weird, but I’ve found that cooking with utensils, dishes, etc, that I really love, makes dinner-making a much more enjoyable experience especially after a long day. 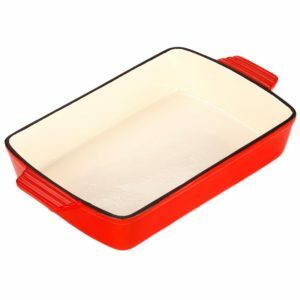 This red cast iron casserole dish is on my wish list. I love my cast iron dutch oven and so this would be a perfect mate. I really like the look of it but after having several glass and ceramic casserole dishes break, the durability of it is what’s most appealing. Don’t overcook your shells. Drain immediately after they’re done cooking. Cook properly, they hold their shape better and are easier to stuff. After you drain the shells, don’t let them sit too long. They’ll dry up and start to stick together. I cover mine with a wet paper towel if I need more time to mix up the stuffing. Make sure to stir your jumbo noodles while cooking, otherwise they can stick together and rip when you try to pull them apart. Use your fingers to stuff the shells with the spinach-cheese-meat mixture if a spoon isn’t working well. Browse all my dinner recipes! 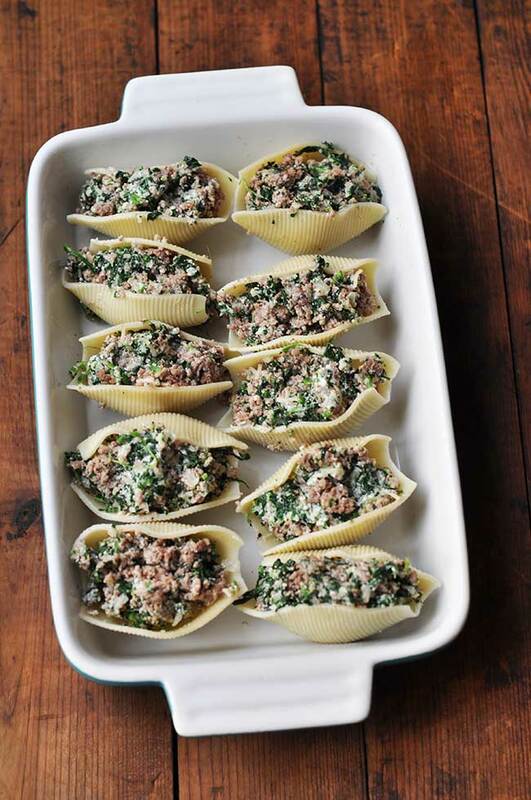 These healthy stuffed shells were featured on South Your Mouth, Menu Plan Monday, and Inspire Me Monday and have been pinned more than 15,000 times with lots of rave reviews! I hope you enjoy them and if so, please let me a review! Hi! Was wondering what is the nutrition facts for this recipe? Calories and stuff like that. Thanks! Super easy to make and love that I can have extra to freeze since I’m making meals to freeze right now while on maternity leave. Never thought I could make stuffed shells until this! It doesn’t say in the recipe where the Italian seasoning goes. Does it go in the meat or tomato sauce? I really would love to try this recipe tonight for dinner! However, I was wondering if you used both ground turkey AND ground beef or is the recipe supposed to have only one or the other? Thanks! I like to use half ground beef and half ground turkey but you can use all beef or all turkey. It’s totally up to you. I like the added flavor that the ground beef brings but not the fat. So that’s why I use half turkey, to reduce the fat, but half beef to kick up the flavor. If you want a more healthy meal, you could go all turkey. Or if you don’t care about fat content as much and are really looking for a richer flavor, you could go all beef. Hope that answers your question. Thanks for asking! So is this calling for 2lbs of meat total? Yes, 2lbs of meat total. Thanks for asking!